Properties in North Peninsula Recreation Area average 4.7 out of 5 stars. Kenai River Fishing at it's best! Property 1: Kenai River Fishing at it's best! Family Friendly Kenai Home Sleeps 10! Property 7: Family Friendly Kenai Home Sleeps 10! Apartment with a view in the heart of the Kenai Peninsula. Property 8: Apartment with a view in the heart of the Kenai Peninsula. Modern Soldotna Townhome Near Kenai River! Property 17: Modern Soldotna Townhome Near Kenai River! 2 bedroom, 1 bath, quiet lodge close to town with forest views! Property 18: 2 bedroom, 1 bath, quiet lodge close to town with forest views! Property 23: Townhome Near Kenai River w/ Deck & Fire Pit! Beautiful getaway located on the bluff with the ocean as your backyard! Property 24: Beautiful getaway located on the bluff with the ocean as your backyard! LOVELY SECLUDED STUDIO - REDUCED WINTER RATES - CLEANING FEE WAIVED! Property 25: LOVELY SECLUDED STUDIO - REDUCED WINTER RATES - CLEANING FEE WAIVED! Enjoy This Relaxing Home At The Beach! Property 27: Enjoy This Relaxing Home At The Beach! Property 35: 2 bedroom, 1 bath quiet lodge close to town with forest views! 3 Bedroom, 1 Bath, Quiet Lodge With Forest Views! Property 38: 3 Bedroom, 1 Bath, Quiet Lodge With Forest Views! Log Cabin Right on the Kenai River with over 500 feet of riverfront access! Property 44: Log Cabin Right on the Kenai River with over 500 feet of riverfront access! 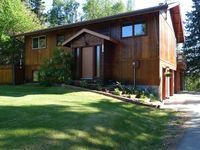 Property 45: 3 Bedroom, 1 Bath Peaceful Lodge Just Minutes From The Kenai River And Soldotna! Property 48: The best location on the Kenai River! Location was close to town. Super clean and nice Alaskan furnishings. beautiful home &amp; convenient location.